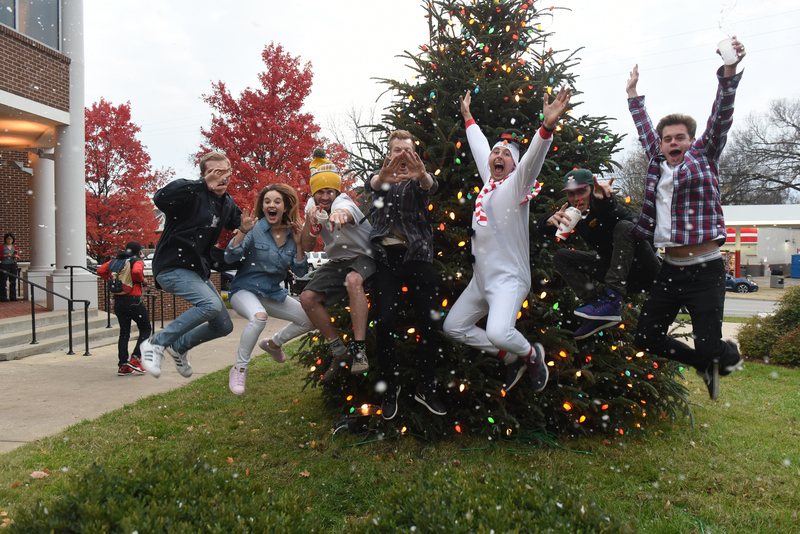 Belmont University bundled up on Tuesday, November 29 to host its second annual Blizzard on the Blvd, an event celebrating the beginning of the Christmas season across campus. Held before the Battle of the Blvd, Belmont’s annual basketball game played against Lipscomb, the celebration included snow machines, holiday treats, Christmas carols and Santa, himself. Students, faculty, staff, alumni and community members gathered around the Christmas tree on Belmont Blvd to kick off the night’s activities. Attendees demonstrated their Christmas spirit by donating spare change to Ms. Cheap’s Penny Drive, the 8th annual event benefiting Second Harvest Food Bank. The festivities continued in the Curb Event Center with gingerbread house decorating, an ugly Christmas sweater competition and family photos with Santa. The Bruins women’s and men’s basketball team both went on to defeat the Lipscomb Bison 100-62 and 64-62, respectively. Both teams broke records during their games. The women’s final score of 100 points are the second most points the team has scored in the Event Center in program history, and the men earned their 10th consecutive victory against Lipscomb, the longest winning streak in the Battle of the Blvd series. After the game, students celebrated in the Curb Cafe as Belmont’s Student Government Association hosted an after party complete with ornament decorating, Christmas music, free food and more.